Safety is the first order of business in cleaning your Beretta. Stripping and cleaning your Beretta 92FS is a straightforward process, similar to that used in cleaning any automatic pistol. 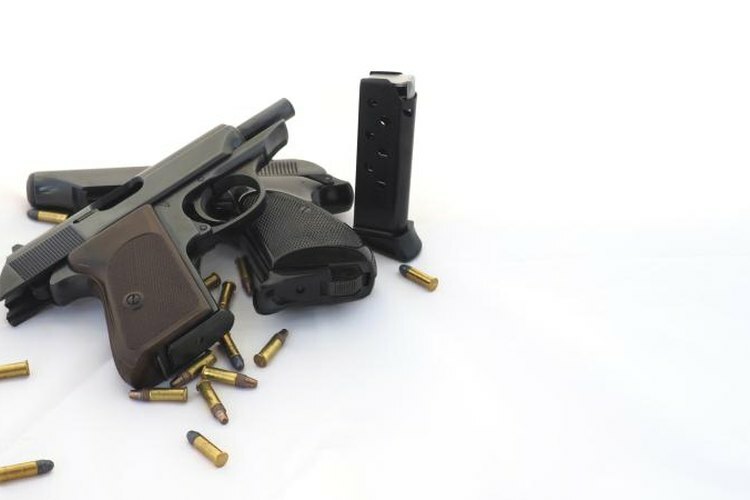 There are a few things to pay attention to, such as the orientation of the recoil spring and the locking block plugs that drop into place in their housing when you reassemble the pistol. The process begins as soon as you unload the pistol and ensure there's no round in the chamber. Hold the pistol so its left side is facing you. Grip the pistol with both hands and press the slide release, just above the forward part of the trigger guard. As you do so, rotate the release button clockwise -- push down on the tab -- until it stops. Pull the slide forward to remove it, the locking block, the recoil spring and the spring guide from the pistol. Note the end of the spring and the spring guide that fits against the locking block; the same end must go there when you reassemble the pistol. Set the receiver aside and turn the slide over. The recoil spring and spring guide are under tension; move cautiously. Press down on the recoil spring and spring guide gently to release the spring and spring guide from the slide. As you lift the spring guide and spring from the slide, hold tension on the spring and allow the spring to expand to its full length slowly. Set the recoil spring aside. Reach into the rear of the slide, from the top; press the locking block plunger and remove the barrel from the slide. Spray the bore brush with gun oil. Insert the bore brush into the barrel through the chamber, and scrub the chamber and bore. Use the bore brush to push bore patches through the chamber and bore, until the patches come out of the bore clean. Soak a piece of flannel in gun oil and clean the locking block with the oil-soaked flannel, scrubbing with the bore brush, if necessary. Set the flannel aside. Put a light coat of gun oil on the outside of the barrel. Soak a bore patch in gun oil and push it through the barrel with the bore brush. Clean the slide, breech face, extractor, slide rails and the inner surfaces of the slide with the gun-oil-soaked piece of flannel. Wipe excess oil from the slide with a clean, dry piece of flannel. Put a drop of oil on the extractor, the firing pin block, the safety switch and the slide release, and set the slide aside, on yet another clean, dry piece of flannel. Clean the recoil spring guide and spring with the bore brush and gun oil. Put a light coat of gun oil on the spring. Wipe down the pistol's frame with the gun-oil-soaked cloth. Wipe the frame clean with a dry piece of flannel and put a few drops of oil on the slide release latch, the magazine catch and the slide stop. Lightly oil the hammer levers. Oil the trigger system, the hammer and the sear. Set the barrel locking assembly into the slide so the barrel is flush against the slide with the extractor in its groove. Inspect the locking block lugs to ensure they're in their housing and the locking block plunger has popped back out at the barrel's base. Compress the recoil spring and replace the spring and recoil spring guide so the head of the spring guide snaps into the groove in the locking block. Glide the slide back onto the frame until it's fully closed and its rear is even with the frame, or slightly past it. Push up on the slide release tab to rotate the slide release counterclockwise until it stops. Check the operation of the safety and work the slide a few times. Be sure to wipe down the magazine with a light, fresh coat of oil before you reinsert it into the pistol. Always clear your pistol before undertaking maintenance or cleaning. Clearing your pistol means removing the magazine, pulling the slide back and physically looking into the chamber to ensure there's no round in the chamber. Always use gun oil to clean and oil your pistol. Designed to withstand the high temperatures, gun oil won't gum up the works the way other types of oil will.